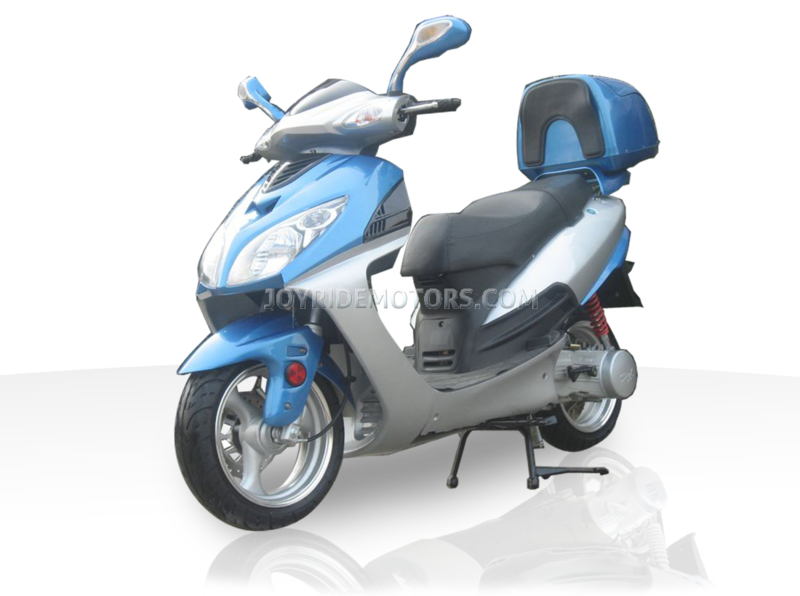 The Boulevard 150cc Scooter for sale is an amazing value that is inexpensive but not at all cheap! The Joy Ride Boulevard 150cc scooter has Bling yet it's practical, and makes you look good when you're cruising down the streets, avenues, and especially down the Boulevard! The Boulevard 150cc Scooter was built for people just like you... who wanna show off and save time and money in the process. And you'll feel those savings each time you open up the throttle and let the 150cc OEM Motor accelerate you past all the downtown traffic congestion. It's said that you should never judge a book by its cover, but go ahead and judge the Boulevard 150cc Scooter for sale. It’s got nothing to hide, and everything to brag about, flaunting its classy and fresh, down-to-business, urban-warrior look that leaves all those other cheap scooters for sale online kicking rocks! You know that the most frustrating thing about living in the city, is dealing with road congestion and parking. This The Boulevard scooter for sale was designed to dominate both while saving you mad money at the pump! Tackle that traffic... and when you slide through that gridlock, check out the looks on the faces of those drivers confined to their cars, or standing at the corner waiting for the bus ... or frantically competing for a cab. They all envy your freedom, mobility and independence as you roll past them in style and comfort! It may be sad for them, but deep inside it's rewarding, cause it makes you recognize how much time ... and money... you're saving on your Boulevard 150cc scooter. And when you pull up to your work, bank, school, apartment... and park right in front, hop off, grab your bag as you stow your helmet in the luggage box, and step right into your destination... the looks of envy on the faces of the car drivers and mass transit riders will be easy to spot. Smile with pride as you gloat on the inside, cause you know how much they wish they were a fierce rider sporting a flashy head turner that goes A to B with style, fun and practicality... cause at one time, you were one of them... until right now when it all changed. The Boulevard 150cc Scooter has a very reliable OEM single cylinder, 9.5 Horsepower, 4-stroke air-cooled engine, fully Automatic Transmission, goes over 55 MPH, gets 85+ MPG, have both an electric and a kick start, front disc brakes, and can carry 2 riders and has plenty of storage! Yah... it's HOT... and a Joy To Ride... so get it now, and ride it next week! It's why you're here isn't it? Sure, you can go and waste some more time trying to find it for less, but we already have and priced below that to maximize your savings and make it a Joy to Ride. The Boulevard scooter is VERY similar to the Joy Ride Downtown Scooter AND The Joy Ride Express Scooter. All three of these vehicles vary in Color and Style, and slightly in price. Neither the Downtown, Express, or Boulevard are CARB compliant SO If you don't live in CA, then no problem, you're gonna save money. 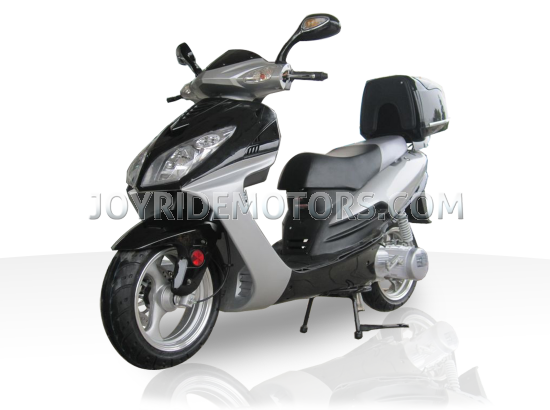 But if you DO live in CA, then check out the Joy Ride Uptown 150cc Scooter. It's very similar in style and color options and it's CARB Compliant so it can be shipped to California. The Boulevard can be Shipped to Every State EXCEPT California. If the photo's and description of the Boulevard 150cc Scooter aren't enough take a moment to ask us, or see what our customers have to say... After a decade of experience in this industry, we know you have lots of questions, so just call us at 1-877-300-8707 and we'll be delighted to answer them all :) To see what our customers have to say about us and our products, please click HERE. THE PRICE YOU SEE IS THE PRICE YOU PAY. NO HIDDEN FEE'S - THATS HOW WE ROLL!